Paulist Fr. Michael Hennessy serves at the Cathedral of St. Andrew in Grand Rapids, MI. He is native of Manchester, NH, the son of Justin and Karen Hennessy. He is a 2004 graduate of St. Anselm College where he studied history. He taught that same subject for eight years at Central High School in Manchester. Fr. Mike discovered the Paulist Fathers through "The Busted Halo Show," a radio talk show hosted by Paulist Fr. Dave Dwyer on SiriusXM's The Catholic Channel. He entered our novitiate in the fall of 2012 and made his first promises to our community during a special Mass on July 27, 2013. He served his pastoral year at Immaculate Conception Church, the parish we serve in Knoxville, TN. In 2016, he appeared in a new video about "The Journey" / "El Camino," a small-group faith-sharing program by Paulist Evangelization Ministries. He made his final promises to the Paulist community on September 1, 2017. Fr. Mike was ordained a priest on Saturday, May 19, 2018, by Cardinal Joseph Tobin (archbishop of Newark, NJ) at our mother church, the Church of St. Paul the Apostle, in New York City. What he enjoyed most about being a theology student: "I loved having the opportunity to grow in my Paulist identity and spirituality within a greater context with other seminarians and religious at the Catholic University of America. Academically, it was exciting to think of the ways I can use the information I learn in my classes with the Paulist mission of evangelizing North America." For more about Deacon Mike, follow him on Facebook, Instagram, Twitter and Pinterest. 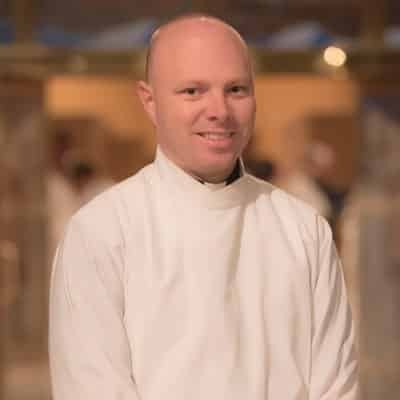 "Life in the priesthood is one of humility," said then-Deacon Mike in this interview with Jennifer Szweda Jordan recorded shortly before his May 2018 ordination as a priest. Evangelization Begins in the Seminary!